Today I walked a mile in Husband's crappy boots. Actually, they were my boots and they were only crappy because I stepped in lots of actual crap. And I had to walk largely because I didn't know how to do this thing called choke on the farm's John Deere Gator. On the agenda today, cleaning out the pens where we keep our farrowing (birthing) sows (mama pigs). 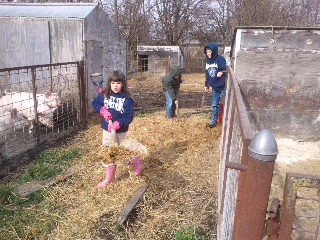 The kids took advantage of the sunny day to help clean one of the pens, scraping out manure and putting in clean straw for the pregnant sow. 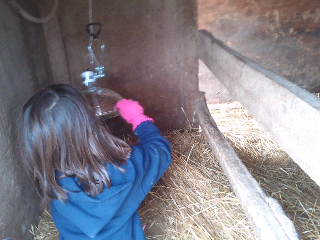 How did we coax our kids away from the TV to go outside and scoop manure in the cold? They couldn't WAIT to do it! While the kids were cleaning out pens for expectant sows, Husband was busy stealing the piglets from their mothers (briefly) to give them their ear notches﻿ and shots. Ear notches are small cuts to the edge of a pig's ear that will identify it for the rest of its life. Look at the notches in the sow's ear above. The notches are a secret code among farmers. 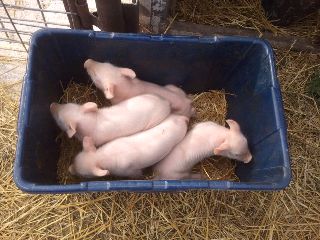 Good mothers that they are, the sows are concerned when Husband arrives to take their babies away in the recycling bin (who says farmers aren't green).﻿ The sow above paced the whole time her babies were out of her sight. One reason Husband takes them away is that the pigs squeal when they get their shots and ear notches, which further aggravates their mother and all of the other sows around too. 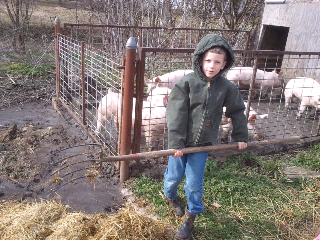 He doesn't want the little pigs to get too cold either. And what was my job? Well, in addition to supervising, taking photos, abandoning the stalled Gator in the barnyard and getting the wrong bulbs for the heat lamps, I'm not sure what value I added. I was assigned the job of installing heat lamps for little pigs that will be born later this week, a task I ably delegated to Morgan. I did also take it upon myself to help capture some little pigs that had escaped from their pen. Ryan and I worked to chase them back through the gate we opened. One little pig was too afraid and ran around squealing. I tried to grab it when it flew past me and I fell on the ground. 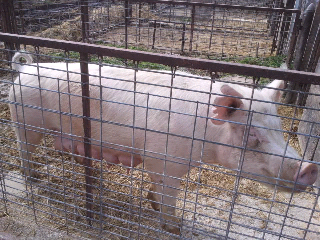 Pigs were squealing, sows were pacing and I was down. When I finally got up the boys said, good job Mom. I didn't even see the pig crawl back under the fence but I'll take it. I helped for way less than two hours, came inside took a shower and was completely exhausted. Husband does all this 365 days a year and doesn't complain. It's nearly midnight as I write this and Husband is getting ready for bed. He will get up at 4 a.m. and go outside in freezing temperatures to check on his sows. I wish more people--especially people who pass judgement on agriculture--could walk a mile in his crappy boots.